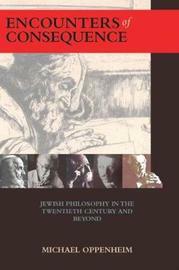 This book provides an introduction and deeper analysis of the situation of Jewish philosophy in the last century and beyond. It charts Jewish philosophy's engagement with modernity and post-modernity along two overlapping axes; underlying issues and significant twentieth century Jewish philosophers. Throughout its history, modern Jewish philosophy has confronted such issues as: the nature of Judaism, Jewish identity, meaning, continuity, the value of remaining a Jew, authority and change in Jewish law, and the particular challenges of history (including the Holocaust), feminist Judaism, and religious pluralism. Featured are those philosophers of encounter: Franz Rosenzweig, Martin Buber, and Emmanuel Levinas, as well as Joseph Soloveitchik, Gershom Scholem, .Arthur Cohen, Eliezer Schweid, Emil Fackenheim, and Irving Greenberg. Michael Oppenheim (Ph.D. University of California - Santa Barbara) is Professor in the Department of Religion at Concordia University in Montreal. He is the author of Jewish Philosophy and Psychoanalysis: Narrating the Interhuman (2006). He has published books and articles in the areas of modern Jewish philosophy, Judaism in the modern period, philosophy of religion and psychology of religion.